I wanted let you know of this project I’ve been working on and that you might find interesting: As a photographer I’ve been working with my own body in front of a camera and I’ve made a photo book about my memories from school, because being in school is weird, being a teenager in school is weirder and my time there was especially weird. During the past years I’ve kept my used teenage uniforms, and created images, that I hope to share with you to give you an insight with a photo story that shares what happened there, what I saw, what it felt like. This recreation was a methodical effort. I stalked people’s old photos on Facebook, I had a list (I keep a lot of lists) of moments, of memories from what I witnessed back then. Then continued to shoot myself all over the city of Bogotá, especially around the neighborhood I grew up in and reenacted through images, my experiences of those transgressive school moments as faithfully as I could. There are a lot of behaviors almost exclusive to school-like environments, some which are unexpectedly outrageous, or silly and simple and some that are… just hot (Specially if you are boy, a queer boy, in a boys-only catholic school.) The themes of bullying, hazing, boyhood and masculinity are at the cornerstone of this work. 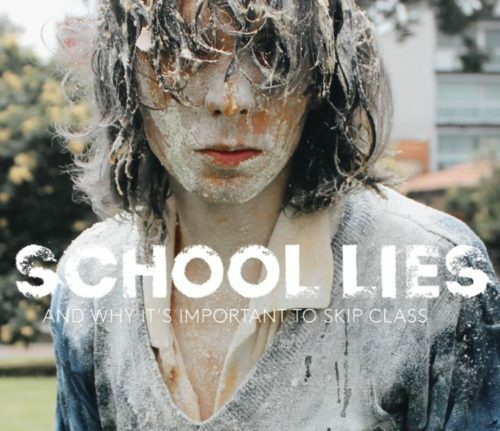 Now, I’m looking for your help, to publish a photo-book I created called: School Lies. Check out the thong pic – your buddy Xag has an impressive package. As for School Lies, forget it. This whole teenage angst thing is way overplayed. 99% of kids come out of school without PTSD and do just fine getting on with their lives. Besides, if high school wasn’t such a byzantine drama fest, how or when would we be prepared for the politics and jungle warfare that awaits in corporate life? We live and learn, and it works. Get on with it. 1. Boys do not do girl things except experimentally. They might play it. They may run down the street in girls clothing and play female even as an adult. Remember queer bars with guys in women’s clothing and guys in the military, ‘camp humor’, and performing. [Meet a few performers and they are NOT female but male Queers with that female thing.] Remember j. Edgar Hover and General McGarther, neither Queer. To actually BELIEVE you are a girl is another thing. 2. If people do not lie they never get to any truth. People must lie or die. Except by analyzing the real lies versus the accuracy and correctness, and etc. … they have to figure the differences and work at it and WORK IT OUT. Half of modern science id full of lies. That is an exaggeration, but you get the point. Want an example ? AIDS is not from some ‘discovery’ in the 1970’s. AIDS begins, as far as they figure, in the 1930’s. The medical specialists LIE. They also do not sterilize the needles in the ‘old days’, especially in Africa. 3. LIES in school [and in life] is so common, the students [and the people] go crazy or go along or figure it out and move on. TOUGH.